Are you a fan of NetEnt’s groundbreaking slot machines? Have you always wanted to get a drone but could never spare the funds for it? Well, now you can get both a free new drone as well as enjoy some exclusive NetEnt bonuses thanks to Bitcasino and Fortune Jack’s latest casino promotions. To learn more about either offer, just keep reading. After last’s months Facebook prize raffle, Bitcasino is launching yet another Facebook promotion to stimulate its players into hanging out on the casino’s official social media page. But this time Bitcasino isn’t giving away any money but a new DJI Phantom 4 Drone. Like last month, the casino doesn’t have any special requirements for players who want to enter the competition. All you need is to go to Bitcasino’s Facebook page, like the picture of the drone, and you can win yourself a ticket for the competition. And if you want to get an extra ticket, you can do so by answering the question “Would you fly to the moon with this drone?” in the comment section of the photograph. The DJI Phantom 4 Drone has a top speed of 72 km/h and can be controlled even from a distance of 7km. It comes equipped with a 20 MP camera with a 60fps 4K video-shooting capability and it can be yours if you claim your ticket by July 1st. On this date, the casino will announce the winner in the comment section and contact the lucky punter to arrange the delivery of the prize. If you want to learn more about this interesting offer, you can head down to Bitcasino and find the Promotions menu. One of the best online slot makers, NetEnt, has arrived at Fortune Jack Casino and the marketing team at the operator wants to celebrate this special occasion by giving something back to the players. Thus, the casino is launching a new exclusive NetEnt bonus aimed at any player who is a fan of the creative games from the pioneering Swedish studio. The bonus is a 100% match offer with a maximum amount of 1 BTC. The promotion is open to any player at the casino but only if they meet the minimum deposit requirements of 0.002 BTC. Once claimed, players will have 10 days to wager the bonus money on any NetEnt game they like. 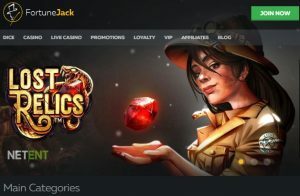 There are currently around 130 NetEnt games at Fortune Jack Casino, including new captivating slots like the Lost Relics and Jumanji. Other hit slot machines like Gonzo’s Quest and Copy Cats are also to be found inside the game portfolio and so are NetEnt’s proprietary table games like Blackjack Touch Single Deck, High-Limit French Roulette, and Texas Hold ’Em Professional Series. If you want to see the full NetEnt collection at the casino, you can use this link to pay Fortune Jack a visit today.